Consumers have become increasingly aware of the importance of fresh food, and want to know where their food comes from, how it is grown, and how it is processed. Locally grown food can meet some of these demands. This tool explains how farmers' markets can provide locally grown produce and other foods, and how they can help the local economy. A farmers' market is a seasonal commercial land use that is typically permitted by zoning ordinances as a "by-right" land use within a commercial or business zoning district, and is often permitted as an accessory use to the primary activity on the site. A farmers' market is the traditional outlet for farmers to sell their products to the local community, and it directly connects the community with fresh produce that was locally grown. 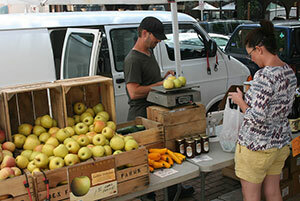 Energy Conservation: Farmers' markets can avoid the costs of long-distance transportation to other markets. Consumers receive fresh produce and other products directly from the farmer or producer, and also avoid the costs associated with storage, warehousing and high retailer overheads. Better Market Response: Closer contact between the farmer and his or her customer base also permits better feedback about what other produce could be offered, when crops could expected to be harvested, and growing techniques and practices. Limited Produce Selection: The range of produce offered at a farmers' market is limited to what can be locally grown. Out of season fruits and vegetables are not typically offered unless local market gardeners are using hot-house cultivation. Municipal Regulatory Requirements: Farmers' markets are intended to provide seasonal opportunities for local farmers to meet local consumer demand. Municipalities may need to provide additional regulatory overview of farmers' markets to prevent them from offering non-local or non-food items or evolving into conventional retail establishments. If a municipality is to be proactive in attracting a farmers' market, ordinance language should be created that would permit markets in locations that would cause the least disruption to adjacent areas. Typically, farmers' markets operate only on a limited weekly schedule, and zoning ordinances can permit them as by-right uses or as accessory uses. The impacts in the vicinity of the market are usually temporary, but they could nevertheless be disruptive. A land development plan may be required, but this may be waived by the municipality when the proposed market is limited in size and duration, when traffic issues are not anticipated, or if existing non-impervious areas are to be used and no stormwater management facilities are required. The market's parking area should have two access points to the surrounding road network, but a one-way internal traffic flow should be used. Parking areas should be separated from the market stall and pedestrians areas. A plan showing the location of the road's access points, the parking lot and the stall area should be part of the permit application. The municipality should also consider requiring the farmers' market to provide trash containers for both the stall operators and customers. Other public amenities such as restrooms, water fountains and shaded seating at the market site would be desirable. 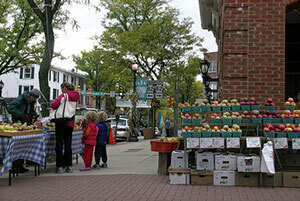 The City of Coatesville added farmers' markets to the definitions in its zoning ordinance in 2005. East Goshen permits the seasonal sale of farm produce in the C-1 Community Commercial Zoning District as a by-right use, but limits them to 180 days per year, allows the sale of Christmas trees, and requires the farm stand to be portable and to be removed during seasons when the market is not operating, requires setbacks and a plan showing parking, circulation, and nuisance controls. The Chester County Agricultural Development Council's Guide to Local Farm Products showcases the County's local agricultural products, and includes an interactive map. The American Planning Association provides information on farmers' markets and Food System Planning. The Farmers Market Coalition is an advocacy group that seeks to strengthen farmers markets' capacity to serve farmers, consumers, and communities by providing the rapidly growing movement with information, tools, and representation at state and federal levels. 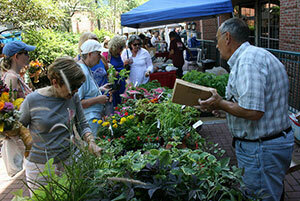 The University of Missouri Extension answers Frequently Asked Questions on Starting and Operating a Farmers Market.